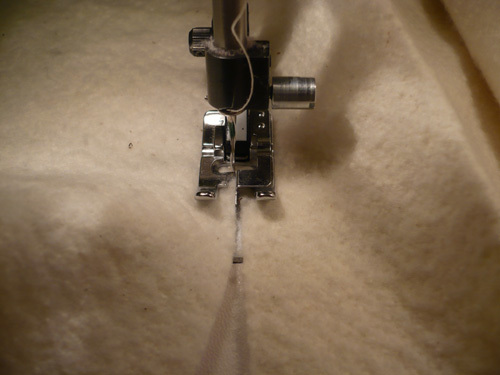 The joining edge foot is a time and life saver! I talked about the foot here, and last night as I pieced the batting together using the joining edge foot I (well my husband actually took the picture) took a picture for you to see how it works. 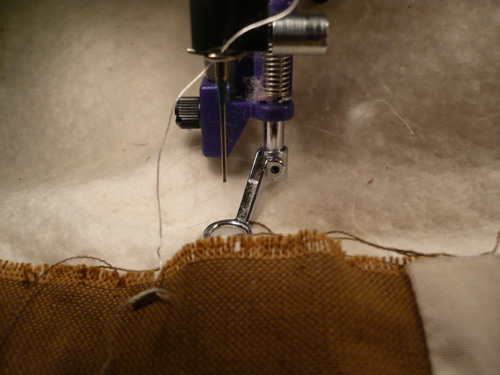 The concept is pretty simple: set your machine to a zig zag stitch (or similar stitch); take two pieces of batting and place under the presser foot; one piece to the left of the straight metal joining piece and one piece to the right of the straight metal joining piece; stitch. The end result is a straight flat seam joining the raw edges of both pieces of batting. Absolutely perfect for joining batting, using up those scraps of batting, and saving money!!! I have been a bit intimidated really freaked out about finishing the Urban Nature quilt top, and that’s why I’ve been busying myself with other projects. But this week I got the urge to complete this project, and much to my surprise, the quilt top actually came together quite nicely and pretty quickly, especially considering the 95 inch square size. Then it was on to getting the quilt top ready to quilt. 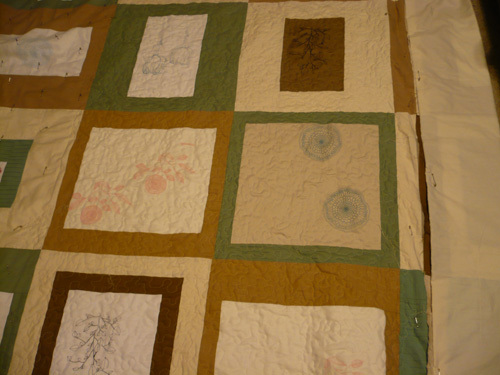 I decided to do straight line quilting with some outline quilting and some other stuff. So to make it more manageable I figured on piecing the batting. I cut a piece of batting about 35 x 108, and pinned the center of the quilt. 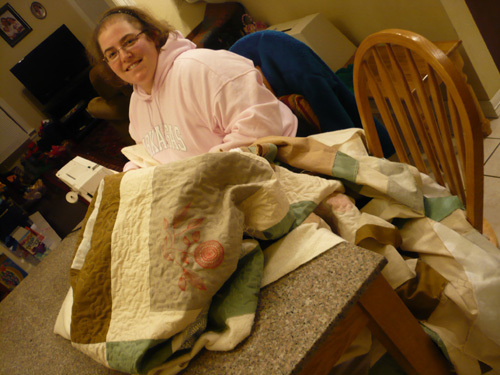 I then folded both sides very compactly and pinned them down so they wouldn’t turn into a ridiculous pile of fabric. I started my straight line quilting and while I think straight line quilting can look really cool, I absolutely loathe doing it. So I ripped the little bit of straight line quilting out and decided I would do an all over meander. So I quilted the center section. Tonight I pieced the batting on the right side and quilted one more row (totally recommend the joining foot for your machine…makes piecing the batting pretty easy and there’s no bulky seam…think zig zag stitch to to join the edges of the batting together, and the result is totally flat). For some reason I broke 4 needles…I rarely break needles so this was strange, and I can’t figure out why the needles were breaking…I wasn’t running over pins, so by the time the 4th one broke, I decided that enough was enough for tonight. It’s taking A LONG time but it’s coming along and it looks really good. I honestly never thought I would be able to quilt something this big! Far left row: pin basted and ready to quilt. 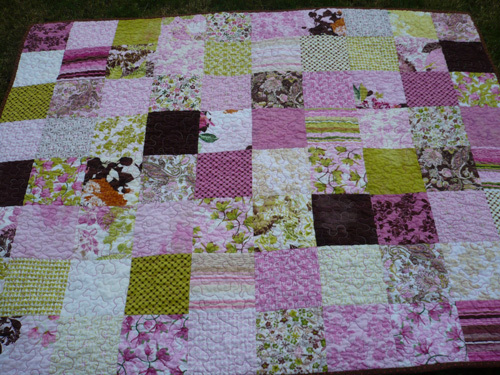 Middle 2 rows: quilted rows. Far right row: neatly folded top and back pinned down to make it a more manageable size. I cannot even imagine how heavy this baby would be if I had sandwiched the whole thing and pin basted the whole thing! 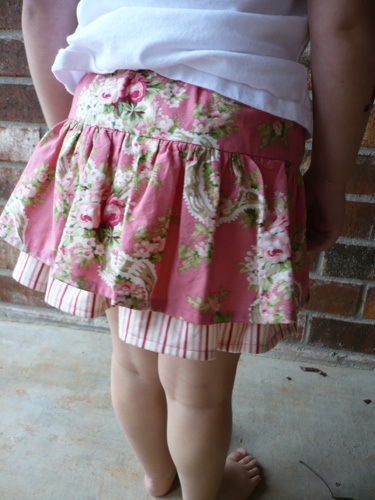 I made my daughter an adorable layered skirt. Each layer has a dropped gathered waist…big accomplishment for me seeing this was my first time gathering! The top layer is a vintage rose floral pattern and the bottom layer is a dark and light pink stripe. 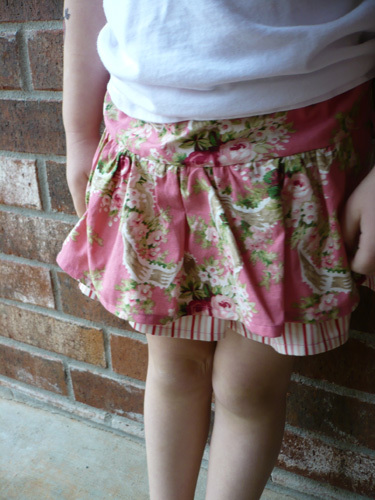 I love the fabrics together, and the skirt is super cute, but too short for my princess. I bought lots of different fabric to make skirts, so more are definitely on the horizon. 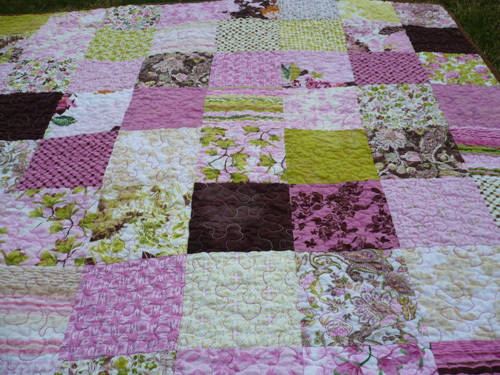 My daughter’s preschool is having a silent auction, and I volunteered to make a baby quilt. 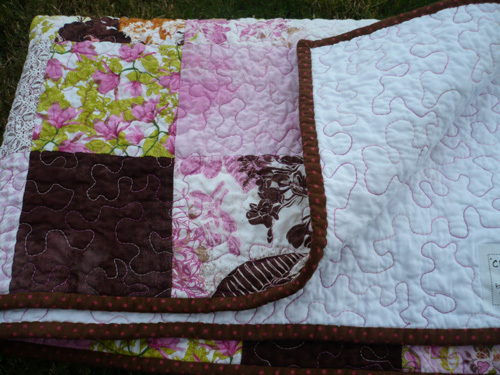 I love baby quilts, because they are quick to make and oh so satisfying. I chose 2 charm packs of Sultry by Basic Grey for Moda and set them 8 x 10. No matter how many quilts I do and new styles I try, I absolutely love the simplicity of the 5 inch squares. It’s probably quiltmaking at its simplest, but I’m so drawn to these quilts. The post wash measurements are 33 x 42. 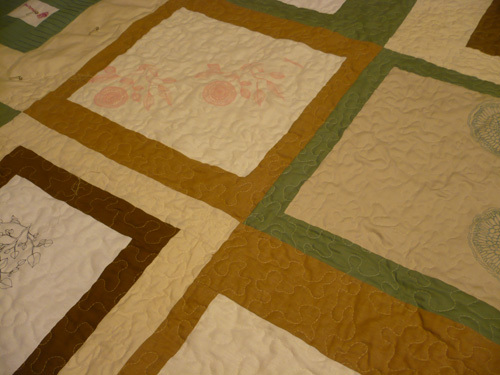 The back of the quilt is white muslin, and I quilted with Sulky Blendables Vintage Rose (#4030) thread.